Wedding in winter: Do the right choices! 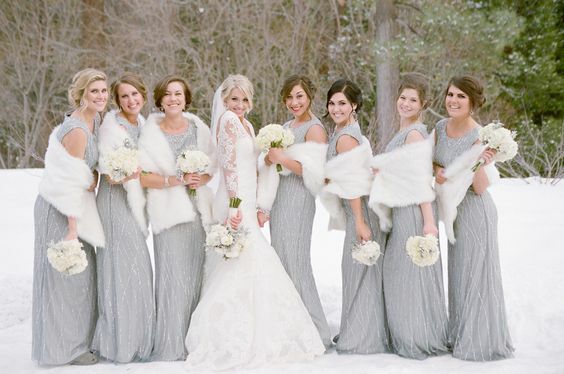 Getting married in the winter can be very charming! More and more weddings in winter become highly required. It starts by choosing colors that are warmer and than with various decorative choices, menu and drinks. But the idea of a winter wedding can also create worries to the bride and groom: the choice of location and the clothes to wear, the menu and many other details. To help you in your choice, I’ve prepared a few important tips to allow you to have an unforgettable wedding even in the coldest season of the year. The place where the marriage will take place must be very carefully considered to avoid any inconvenience for you and for your guests. Needless to say, the outdoor ceremonies are to be avoided. A beautiful cabin, decorated in an elegant and welcoming style, it’ll be definitely a great solution. Colors are very important in the design of the setting, focus on shades of red, orange and cherry. An element that can’t miss in a winter wedding are the candles that will give the fascinating touch and will warm your guests. The colors can be dark or neutral and the preferable tissues are going to be those with heavier filaments, but of course the final decision will depend on the location and on the time of the wedding. For you, the recommendation is to choose the dress that best enhances your body and that makes you dream, then, forget the heavy clothing or too closed and bet on models with tulle sleeves and with embroidery or lace applications. I particularly love the elegance of winter and I’m sure that if you choose this time of the season to crown your dream, with the necessary adjustments and following a suitable color palette you’ll have a memorable and unforgettable day!